The Topo Athletic Ultrafly brings serious cushion, bounce and a touch of stability to Topo Athletic's low drop platform, roomy toe boxes, wide on the road stance, and superb, well held uppers. At 28mm heel/23mm forefoot Ultrafly weighs 10 oz/283 g, men's US 9. It has a tri density midsole with a soft foam insert at the heel and a firmer foam at mid foot, for a touch of barely noticeable pronation support. 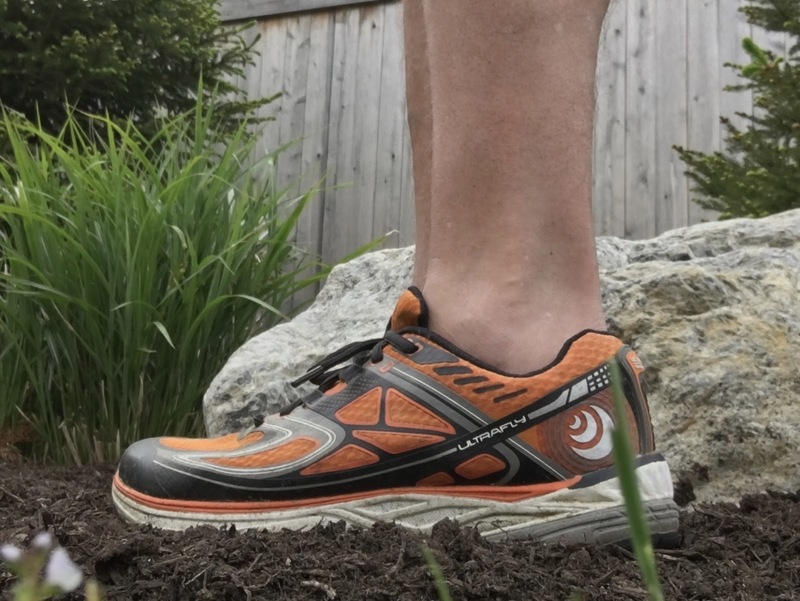 Ultrafly is more shoe and a softer shoe than one of my road to trail favorites of 2015, the Topo Magnifly (review) with its 25/20 stack and 9oz US 9 weight. 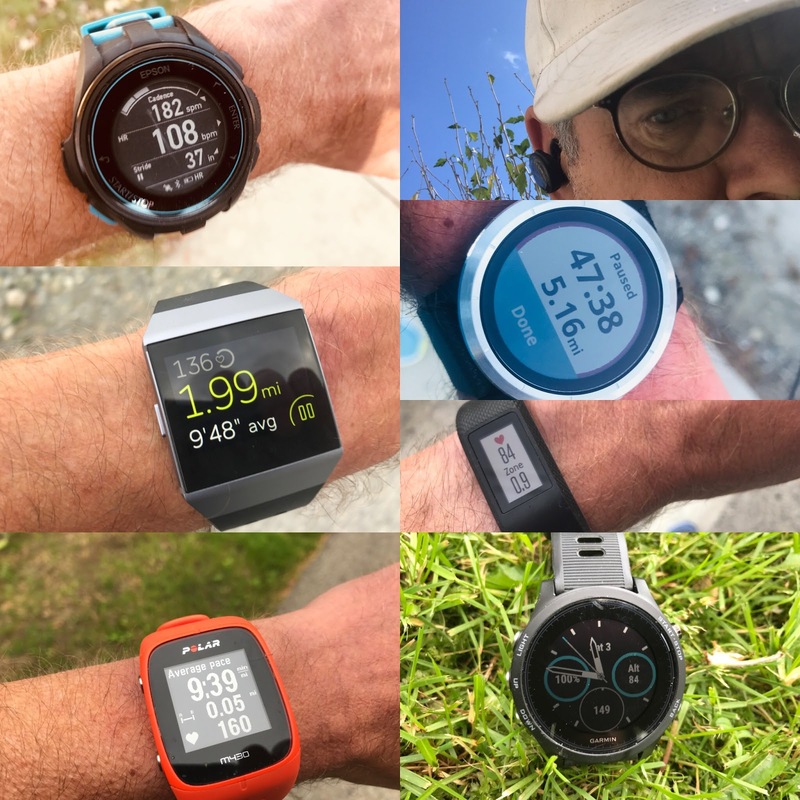 The differences are felt with the Ultrafly now providing enough cushion for long road miles for me which Magnifly didn't, but losing some of the agility and road trail feel. Did I say this was a road shoe? Well yes it is but given the superb uppers of both Topos and their full decently lugged rubber coverage they also make fantastic road trail hybrids. Don't know Topo Athletic. Well here is what we said about their DNA and ride for the Magnifly (review). All the same applies to the Ultra with a touch less road and trail feel and mid foot sweet spot but with considerably more long miles comfort. Altra's Zero Drop heel to toe works for you, but not all the time and at all speeds. Their Foot Shaped toe box is super comfy walking around but is a bit to loose and unconstructed when the pace picks up. Newton's lug system and the feedback they provide to encourage a mid foot strike is useful but sometimes you find the lugs "in the way"
you're like the modern seamless uppers on many shoes but what's under the foot doesn't always mesh with what's above and some of the light uppers just don't provide enough support for forays onto trails or at speed." The midsole features a 3 part construction of differing durometer or firmness: the black medial insert is 12% harder than the white main midsole material, the gray lateral heel insert is 10% softer than the white midsole. The medial (inside) has a firm black foam which stops a 1/3 of an inch further back than the lateral gray insert. It is firm foam but interestingly on the run not noticeable as a support mechanism under arch, often the case with the stability "posts" found in motion control shoes. In part this may be because the arch area midsole is sculpted with none of the usual flaring for such shoes, and the layer tapers front and back and is not a monolithic block. The result is a overall soft under foot feeling with a smooth mid foot to forefoot transition at all speeds. The rear foot to mid foot transition is another story at slower speeds back on the heels, the way I often run... The heel is soft feeling, or the foot, unless landing further forward has a bit of difficulty transitioning to the firmer medial side. This impression is in part likely caused by the use of a soft EVA Strobel board under the sock liner instead of the more usual firmer and stiffer textile approach. A textile approach might firm up the landing a bit. The use of the EVA board, a last minute change according to Topo, also increased the weight from 9.2 oz to approximately 10 oz. 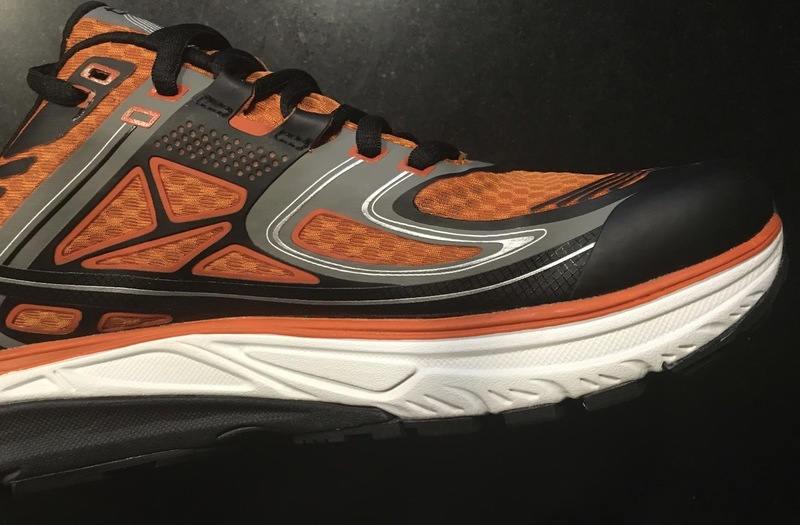 I think Topo should have either chosen the lighter stiffer textile board or a slightly firmer heel insert foam but not both to increase the overall snap of the shoe. 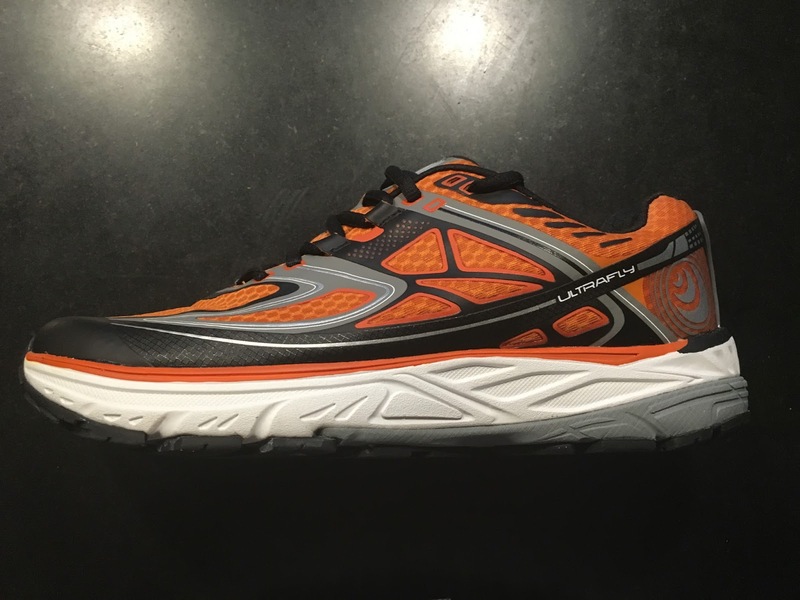 Pick up the pace, for me to 9:20 per mile or faster, and the soft heel disappears and back to front transition is smooth and fluid and very bouncy reminding me of the Hoka Speedgoat's lively midsole and to a lesser extent adidas Boost trainers'. 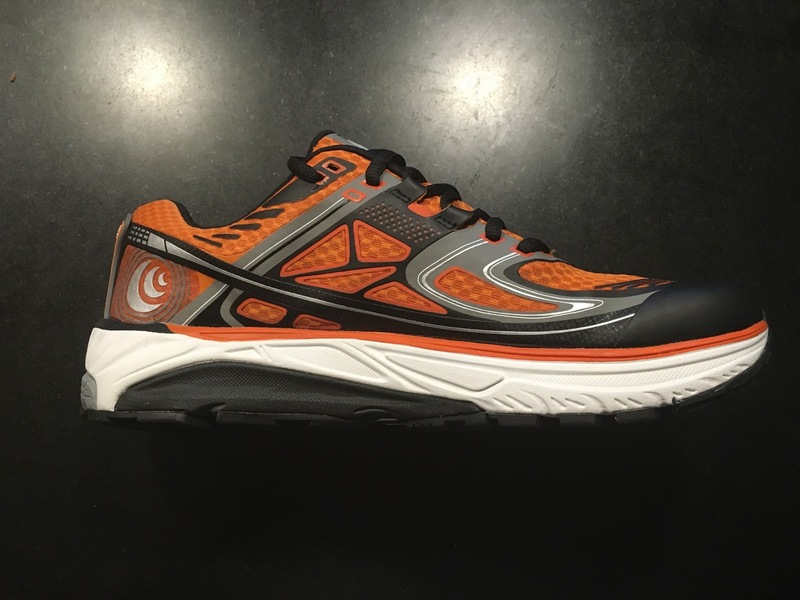 In keeping with Topo's focus on natural running, the use of the soft foam at the heel does encourage a mid foot landing, providing the runner feedback and a sensory path forward in their landings. Not quite as obvious and easy to tune as the Magnifly where it was the firmness of the heel that had me seeking a landing a bit further forward but still there. The softness of the heel also gives one the impression as the foot compresses that gray insert that the heel toe drop is lower than the actual 5mm. Those seeking a soft low drop heel toe drop feeling will love the Ultrafly which almost runs like the zero drop Altras at slow speed yet has none of that "missing some heel" feeling I get with Altras. The 23mm of forefoot cushioning makes the Ultrafly into what I classify as a "maximal" shoe, any shoe with 23mm or more forefoot stack. Push off for such a big stack is smooth, flexible, decently responsive and wonderfully well cushioned. 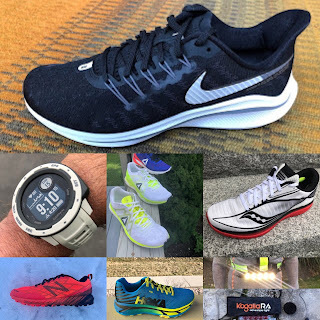 It does not have the pop of the Altra Impulse, my 2015 Shoe of Year with its channeled midsole, light stability features, somewhat lower stack, and lighter weight but for long daily miles the more forgiving UltraFly is a better choice. The outsole is solid thick carbon rubber with plenty of cutouts for flexibility in the outsole but only shallow flex cuts in the mid sole foam thus increasing the stability of the shoe. The durability has been very good with zero wear at my usual heel wear points and only a bit of scuffing up at the toe The flex is similar to the Salming Distance 3( review) with a somewhat later flex on the medial side than lateral side. The propulsive effect and spring is less felt in the Ultrafly as it has more midsole thickness and broader thicker outsole coverage but it is there. Topo has outstanding upper construction and fit, for me the best overall of any shoe brand today. From the wide and high toe box extending back to a flawless mid and rear foot hold, the Ultrafly upper is very similar to the Magnifly. It fit me true to size and very similarly to Magnifly. The soft thin mesh has an intricate pattern of immaculately applied overlays of various patterns. Breathability is outstanding as no overlay area seals off the foot, even over the mid foot. The tongue is a lightly padded non bootie construction. Lace up is easy and secure, no fiddling in part due to the conforming wrap of the combination of decently padded tongue thin mesh upper and those overlays. The achilles hold is secure and comfortable as is the collar. The heel counter is semi rigid with the midsole heel stays wrapping up around the heel to stabilize the foot over the platform. The Ultrafly is a very well cushioned trainer with a bouncy ride and great flexibility for its stack. It provides a touch of guidance without over controlling foot motion and without any sensation there is a stability element present. They should prove long lasting and durable. 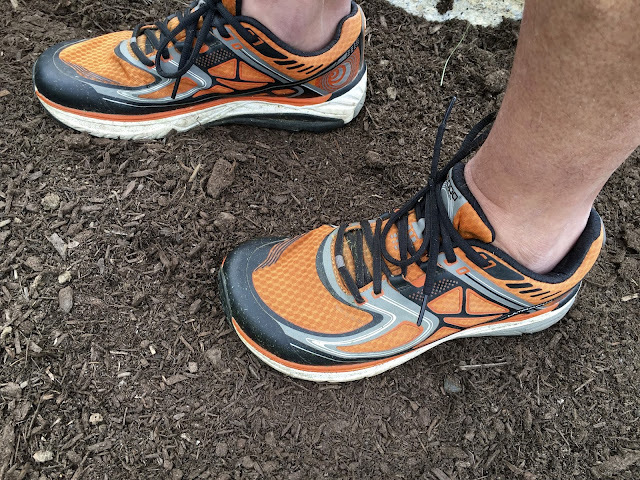 I have enjoyed them for moderate tempo long runs, trail running and with their outstandingly comfortable upper and toe box for every day wear. A bit lighter and with a somewhat firmer overall ride, especially at the heel, would make them an even better shoe. 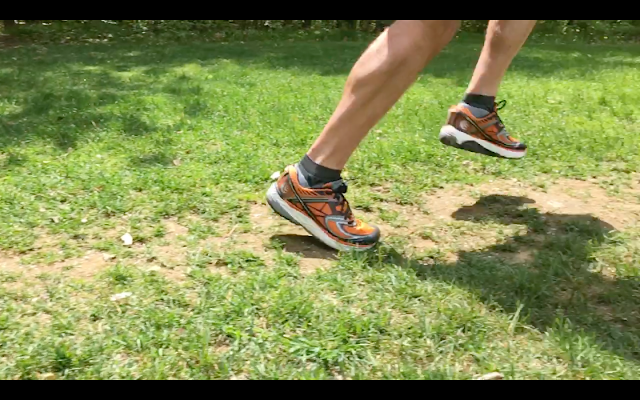 light guidance/stability that even a neutral foot runner will not notice. Available now in men's and women's sizes. $120. The Topo Ultrafly was provided at no charge to RoadTrailRun. The opinions herein are entirely the author's. Interested in other 2016 shoes? Road Trail Run has reviewed 30 different models in the last 6 months! Click here for our summary page with links to all the reviews. Use Road Trail Run Coupon Code: RTR10 for 10% off! Hi Sam, thanks for the in-depth review! How is the sizing compared with the Magnifly? Ultrafly fit me true to size and very similarly to Magnifly.